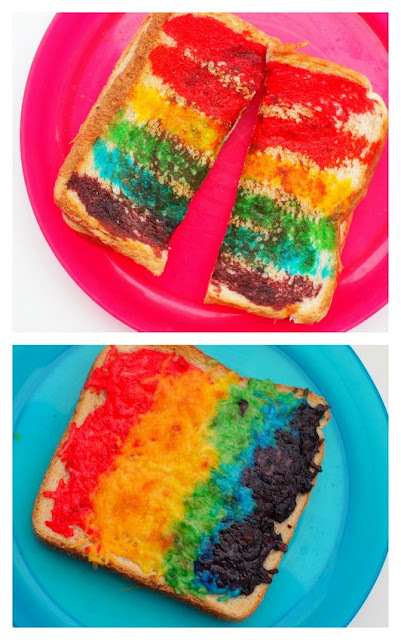 Ok Wanna know the secret to making these fabulously colorful rainbow grilled cheese sandwiches? Now here are 2 ways of making them! Mix drops of Gel food coloring with milk. Watch in amazement as the milk turns super brightly colored. Then, grab a cooking brush and paint your bread! Aren't the colors just yummy? Then, place your bread on a pan, and make grilled cheese sandwiches like you normally would. :) Ooh la la! You've got yourself a colorful and edible piece of art! This time, we're going to dye our cheese rainbow colors. Once again, grab your Gel food coloring and mix it with your favorite white cheese. Only a few drops will do! and you've got yourself an open-faced rainbow grilled cheese sandwich! My son happens to love corn tortillas, so we made him an open-faced rainbow tortilla on the frying pan. 16 More Creative and Fun Food Activities! Shake shake- make your own butter!